CAL is a voluntary organisation which campaigns to achieve urgently and sustainably full compliance with World Health Organisation (WHO) guidelines for air quality throughout London and elsewhere. Further information about CAL can be found at https://cleanair.london/. Airport related traffic is a major cause of air pollution in London, which in turn causes thousands of premature deaths per year, and many thousands more illnesses, chronic illness and disability. For this reason, airport expansion impacts on air pollution. You may be aware of guidance published by Environmental Protection UK (EPUK) in 2010. That guidance has been updated by EPUK and the Institute of Air Quality Management. However, neither EPUK’s 2010 guidance nor the updated guidance takes account of or correctly states the significance of the very recent legal developments which have clarified to the law. For that reason inter alia it is our view that the guidance is flawed in important respects. The legal judgments, letter of clarification previously from the European Commission to CAL (attached), Directive 2008/50/EC on ambient air quality and cleaner air for Europe and prospect of escalating infraction action make clear inter alia that: NO2 limit values must be achieved urgently and ‘as soon as possible’ to protect public health; limit values are absolute obligations that must be attained irrespective of cost; limit values apply everywhere with three exceptions; limit values must not be exceeded once attained; and where air quality is ‘good’, Article 12 of the directive applies i.e. Member States shall not only maintain the levels below the limit values but also “endeavour to preserve the best ambient air quality compatible with sustainable development”. This report states that: “The assessment has considered changes within a “Principal AIRPORTS COMMISSION AIR QUALITY: Executive Summary ASSESSMENT ii Study Area”, which encompasses a 2km radius around each Scheme boundary, and a “Wider Study Area”, which includes all roads for which a significant change in traffic has been forecast” (Executive summary pages i and ii). In CAL’s view, this is not sufficient to assess impacts of air pollution since even very slight worsening of air pollution may be unlawful where limit values are exceeded. The Scheme would not cause any new exceedences of the Limit Value or air quality objective for NO2. 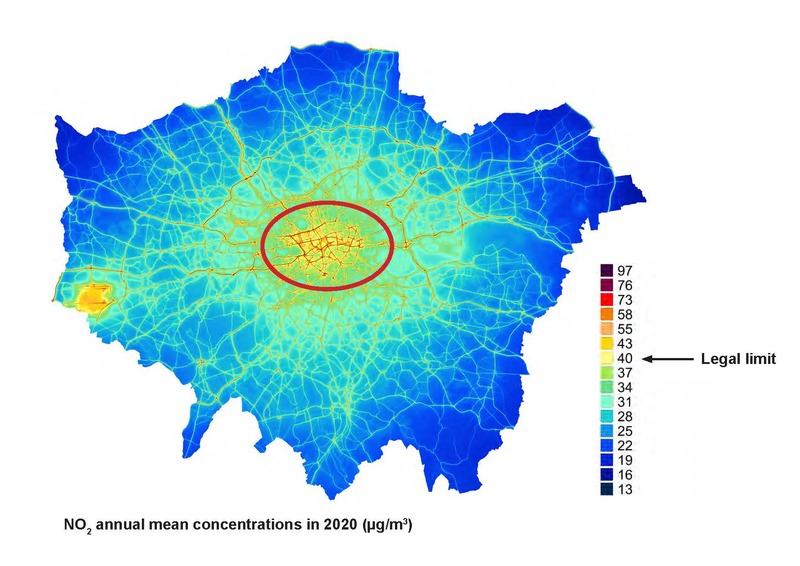 However, the incremental change associated with Heathrow NWR would cause the Bath Road (A4) sector PCM road links to have a marginally higher concentration in 2030 (48.7 µg/m3) than the Maximum PCM Predicted Concentration in the Greater London Agglomeration (which is 48.6 µg/m3 and occurs at Marylebone Road). The unmitigated Heathrow NWR Scheme would thus delay Defra’s predicted date for achieving compliance with the Limit Value. The proposals for the A4 Bath Road in the Heathrow NWR scenario are to realign the road northwards and then to the east around the boundary of the airport, but it is not possible to replicate Defra’s PCM predictions at these realigned links, nor is it possible to confirm whether these new links would be included in the PCM model (due to lack of public exposure) and no further assessment can be provided. the Gatwick scheme is predicted to worsen air quality (in terms of annual mean NO2 concentrations) at about 21,000 properties. This would not be consistent with the duty on Member States under Directive 2008/50/EC to maintain the levels below the limit values and also “endeavour to preserve the best ambient air quality compatible with sustainable development”. The report for the Airports Commission also misunderstands important obligations under Directive 2008/50/EC. In particular, it wrongly assumes that the worsening of air pollution above limit values (i.e. aggravated breaches) has less significance where an air quality zone or agglomeration has worse air pollution elsewhere e.g. in Marylebone Road. This is not correct. Limit values apply everywhere with three exceptions (see Annex III of Directive 2008/50/EC and the letter of clarification referred to earlier). In CAL’s opinion development proposals that worsen air pollution, where limit values are exceeded or likely to be exceeded, must ensure that their genuine net impact would be to improve air quality during demolition, construction and operation and not worsen it. Mitigation measures cannot be relied upon to reduce their impact. Limit values must be attained quickly and cannot thereafter be exceeded. It is apparent from the documents that the two Schemes for Heathrow, if approved, would worsen already illegal concentrations of NO2 in 2030 (and perhaps also in other time frames). The Scheme for Gatwick would not be consistent with sustainable development. To worsen air quality contradicts the duty under Directive 2008/50/EC and would be unlawful. None of the exceptions to attaining limit values applies. Please therefore reject all three Schemes. CAL understands that computer modelling assumes no impact of aviation emissions on ground-level air quality when aircraft are flying above 1,000 metres i.e. outside the landing and take-off cycle. CAL considers it highly unlikely that aircraft flying over Greater London would have no direct impact on ground level air quality or contribute only to background concentrations. Further CAL understands that Terminal 5 at Heathrow could not have been built if proper consideration had been given to the effect of limit values. Please do not make this mistake again. I would be pleased to discuss this submission with you.